There are two methods you can use to demote a Satellite Server. The first method is to use ZENworks Control Center. Instructions for using this method are provided in Removing Satellites from the Server Hierarchy in the ZENworks Primary Server and Satellite Reference. Choose the locale (language) in which you prefer to run the uninstallation program by entering the locale number or pressing Enter to accept the default locale (English). HINT:Press Enter at any prompt to accept the default value. Read the introductory text, then press Enter. Specify the IP address or DNS of a ZENworks Primary Server, then press Enter. You only need to specify the port number if the Primary Server is not using the default (443). Specify the port number of the Primary Server, then press Enter. To use the default port (443), simply press Enter. Specify the username for a ZENworks administrator account that has rights to unregister devices, then press Enter. To use the Administrator account, simply press Enter. Specify the password for the ZENworks administrator account, then press Enter. On the Summary screen, review the details, then press Enter to begin the uninstall process. When demotion of the Satellite Server is complete, press Enter to exist the uninstallation program. To verify that the managed device is no longer a Satellite Server, double-click the icon in the notification area. The Satellite links should no longer be available in the left-navigation pane. Unregister and Uninstall from zone: Select this option to uninstall the ZENworks software and unregister the device in the ZENworks Management Zone. Unregistering the device removes the device object and all references to the object in the zone. 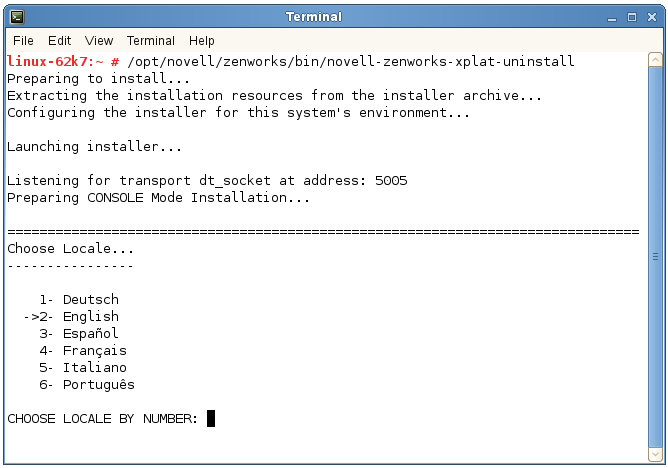 Local Uninstallation only: Select this option to uninstall the ZENworks software but leave the device registered in the zone. In order to perform a local uninstall of the agent software, the Allow Users to Uninstall the ZENworks Agent option must be enabled for the device in ZENworks Control Center. Otherwise, the local uninstallation fails. The option is set at either the zone level (Configuration > Management Zone Settings > Device Management > ZENworks Agent > Agent Security), folder level (Devices > Managed > folder Details > Settings > Device Management > ZENworks Agent > Agent Security), or device level (Devices > device > Settings > Device Management > ZENworks Agent > Agent Security). On the Summary screen, review the details, then press Enter to begin the uninstall process or enter Back to change uninstall options on previous screens. When the uninstall is complete, press Enter to exit the uninstallation program. The ZENworks Agent software was uninstalled. All ZENworks-related RPMs were removed from the device. If the Unregister and Uninstall from zone option was used, the device object was removed from the ZENworks Management Zone. You can verify this in ZENworks Control Center (Devices tab > Managed tab > Servers folder).